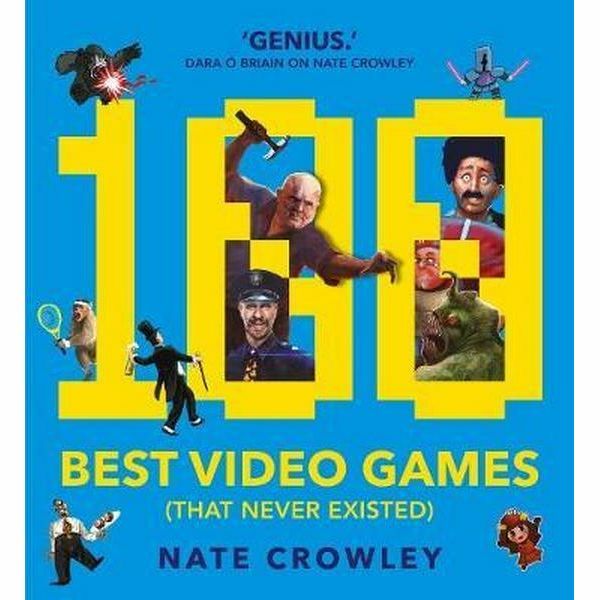 Nate Crowley, 100 Best Video Games (That Never Existed). Solaris Books, 2017. Pp. 260. ISBN 978-1-78108-614-8. $17.99/£12.99. Literature is full of entertaining anecdotes on how books were born: unforgettable personal experiences, reminiscences of a dream, an unusual meeting, surreal coincidences, a strike of inspiration… you name it. This book was born on the internet and, more precisely, on Twitter. Emerging SF writer and game geek Nate Crowley promised a video game concept for each “like” received. The idea was so successful that the thread rapidly got out of hand. Luckily, someone thought that there were enough good seeds there to craft an entire book out of them. The author took things further and didn’t stop at the simple description of the made-up video games, but teamed up with real game designers to sketch very convincing features and even graphics, making this amusing fakery completely believable. I do enjoy the occasional video game session, but what attracted me to this bizarre project was actually my passion for fakes and fabrication. And I wasn’t disappointed. The level of detail that has been devoted to reviewing these nonexistent products is incredible. If, like me, you have a true passion for well crafted fakes, you may even want to use a word like “admirable.” The book is divided into five chronological sections and, of course, the video games that belong to a certain period of time (for example the 90s, or the early 2000s) will reflect the graphic and game plays that were more fashionable in those particular years. Each video game has a two-page slot, that includes a screenshot, a brief description of its features and main narrative setting, and even some reception information that can be a quote from a game magazine or some user evaluations. Fairly obviously, I didn’t read this book sequentially. I just opened it randomly and read about a couple of games every now and then. Each time, I would find something that made me smile. Flicking through the pages you can feel that the authors, including—and maybe especially—the game designers, had a lot of fun creating it. Some titles, and related screenshots, are explicitly grotesque and surreal, like Pub Fight Architects (a game similar to The Sims, but where you design a pub specifically to be the set of drunken fights) or Gothic Soccer (something close to FIFA but where your players pretty much look like the members of Kiss). Others are based on some sort of puns that are sometimes so terrible that they become hilarious, like Beastenders, a gruesome version of the popular British soap opera EastEnders, or the adorable First person shooter in which you have to kill the first person on Earth (a prehistoric dude who doesn't look like he deserves it!). The author, and his creative team, put a lot of effort into differentiating the video games. Not only did they divide them chronologically and try to keep a good balance of different genres, but they also took into account different gaming platforms. We find PC games, console games, some augmented and virtual reality and even a game for smart watches, that combines the 90s Tamagochi experience with classic wisdom: a digital Diogenes on your watch will remind you frequently that he doesn’t like you nor your family and friends. To be fair, some games are just plain bizarre, like Bantelope, where a group of boys incautiously play with a ouja-board and, as a consequence of the dark forces they awaken, the kids get turned into antelopes that have to defend themselves from predators. Other fake games will make you hope that they were really on the market! One of my very favourites is Poetic Justice, a Street Fighter-like game that features the most famous poets of the Western World. Some other games are very, very silly. But have you ever looked at the actual offer of video games? If we mix up Crowley’s made up games with real ones, would you really be able to tell the difference? A special mention I believe is due to a video game that can be considerate almost an inception of fakeries: SPQR, a horror game where the players find themselves trapped “in a provincial museum where the shittily grafted wax statues of Roman soldiers have come to life as flesh eating zombies.” Can you imagine a more terrifying scenario?! The reviews can’t stress enough how “visceral” this virtual experience is! Video games are notoriously bad at portraying women, in spite of them being a fast growing percentage of the community of both developers and consumers. For being a book written by a man, with a creative team also overwhelmingly made of men, the book seems to avoid offensive portrayals, which was definitely a plus. This unusual book is not for everyone’s taste. It is whimsical, sometimes borderline stupid, and walks close to the dad-jokes zone. But it is also entertaining, and truly amusing. I think it would be a fun thing to keep on your table, and a successful ice breaker for dinner parties. And, why not, an inspiration to come up even with more ideas for nonexistent video games (or movies, or comics, or…). Besides the enjoyment of the novel ideas behind these collection of video games, what I have appreciated the most is, again, the accuracy in the fabrication. The title and the main concept of the games in the book might have been thought specifically to make the reader laugh or even snare, but everything around each video game is solid, believable and, therefore, enjoyable as a fakery. Not saying that Borges would have liked it but, who knows, maybe would have half smiled.